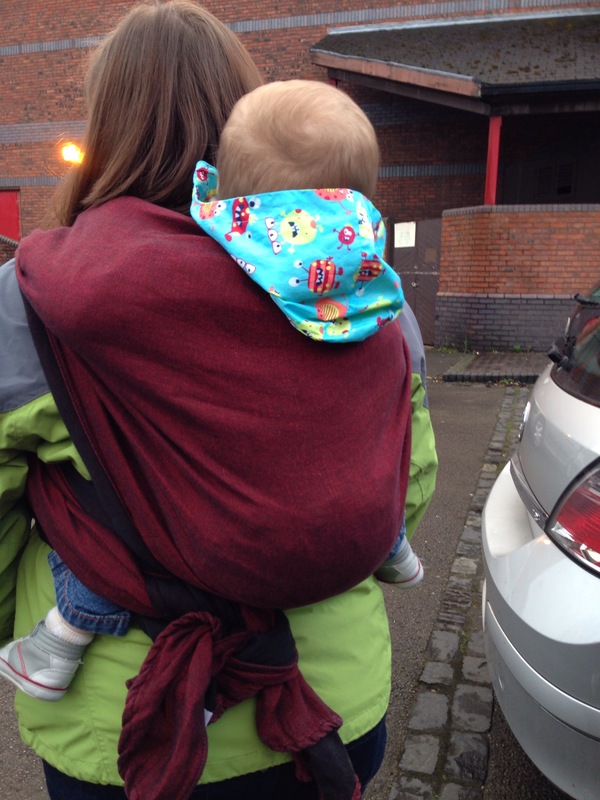 Love to wrap – babywearing at its best! I have loved babywearing since baby boy was tiny, using a stretchy wrap, woven wrap and semi structured buckled carrier. I enjoy carrying with all of them but recently I have found that wrapping is my favourite way of carrying. I think the reason is that we have started to work on back carries. I still enjoy front carries with baby boy snuggled against me. If he is struggling to sleep in the day I know that I can pop him in a front carry in the wrap and he will quickly nod off. However despite being small for his age he is getting heavier and so I decided that it was time to bite the bullet and get to grips with back carrying. I had intended to go along to my local sling group but unfortunately couldn’t make it to the recent meet. I am fully intending to go to the next one! I had no choice but to watch a few tutorials on YouTube and just basically have a go. The first few attempts were a disaster but very slowly I started to get the hang of it. I still need a lot of practise to get it perfect and I want to learn some better carries (I can only do the most basic) but I am happy that my wrapping ability is improving. I even managed to walk half an hour to a relative’s house on New Year’s Day with baby boy in a back carry. I was very pleased with myself. I just hope that my love of babywearing doesn’t turn into an addiction like my love of cloth nappies. I already have a stretchy wrap (soon to go on loan), two woven wraps, a ring sling and an ergo. I think that is enough – for now! Do you love to babywear? What is your favourite carry? « Where did last year go? I completely share your addiction to babywearing…my top top favourite is the ring sling (so small, so light, so versatile). I love the *idea* of a wrap but they are just so BULKY to carry around! Perhaps I need a bigger bag??? Definitely go with a bigger bag. Wrapping is lovely. I have jut bought a ring sling though. My babies are starting to not want to be carried anymore. My youngest two are 3 and a half year old twins. And they really prefer to walk. I’ve always loved the look of wraps and learned a few front carries and only learned a rucksack back carry…but it was my favorite.